ARLINGTON, Texas -- The NCAA president called an effort to unionize players a ''grossly inappropriate'' way to solve problems in college sports while insisting the association has plans to change the school-athlete relationship. Mark Emmert said Sunday that the NCAA wants to allow the big conferences with money-making teams to write their own rules, and those changes could solve many athletes' complaints more effectively than unionization. ''To be perfectly frank, the notion of using a union-employee model to address the challenges that exist in intercollegiate athletics is something that strikes most people as a grossly inappropriate solution to the problems,'' Emmert said at his annual news conference, held the day before college basketball's national championship. The NCAA has spent the past three years writing up plans to change its governance structure to allow the five biggest conferences to have different rules from hundreds of smaller schools. Because smaller schools have fought against costly changes such as paying athletes stipends, the independence of the big schools could break a logjam. Although the issues have been simmering for years, they have drawn attention in recent weeks with a lawsuit filed by former athletes about to go to trial and a National Labor Relations Board director's ruling that Northwestern football players should be able to form a union. If the NCAA loses the unionization fight or the lawsuit, filed by former UCLA basketball player Ed O'Bannon, it could drastically alter the relationship between NCAA schools and 460,000 college athletes. But, Emmert said, nothing the NCAA might do in the coming months will be a direct response to either of those legal cases: ''Those are conversations that have been going on for several years now,'' he said. 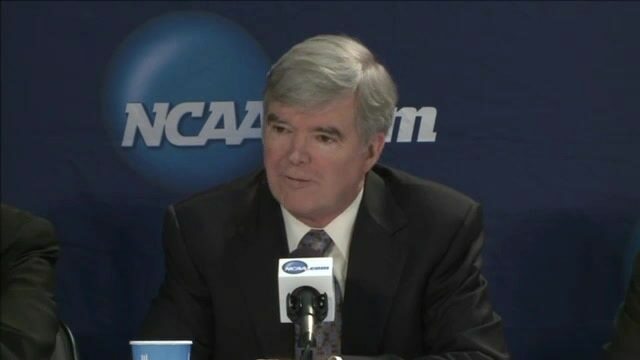 Neither Emmert nor the administrators who joined him for the news conference sounded overly concerned about drawing up contingency plans in case unions start sprouting up in the aftermath of the Northwestern case. Bowlsby and a panel that included presidents at Wake Forest, Kansas State and the future president at Ohio State agreed that many of the NCAA's thorniest issues, including paying athletes and improving their long-term health care, could be more easily resolved if the ACC, Big Ten, Big 12, Pac-12 and SEC were given ''autonomy'' to draw up their own regulations. The idea of giving the five big conferences autonomy -- lest they splinter off from the NCAA completely -- came up about three years ago after the full membership rejected Emmert's proposal for a $2,000 stipend for athletes that would help cover the gap between the value of a scholarship and the real cost of attending school. Smaller schools, especially those that don't play football, can't afford that sort of stipend, while the bigger ones are trying to use some sort of pay-for-play model to keep peace with a growingly discontented group of players. The biggest cash cow for the NCAA, however, is the basketball tournament that wraps up Monday. March Madness garnered a 14-year, $10.8 billion TV contract in 2010. The deal has grown increasingly lucrative through the years in large part because the tournament affords the little schools a chance to go up against the behemoths, and sometimes come out on top. Emmert conceded that many issues, such as the NBA's one-and-done rule, are beyond his control. That's life in the NCAA, which has 351 Division I members, with many different agendas. Though Emmert disagrees with those whose legal maneuverings might undo the NCAA, he recognizes the need for some changes.